In this middle-grades creative-writing curriculum, young writers of fiction and poetry learn vital skills such as point of view, characterization, plotting, dialogue, and description. Simple but innovative exercises encourage young writers to strengthen their vocabulary and become aware of the patterns of sentences. Unlike most “how to write” books, The Creative Writer is designed to be used in a mentor/student relationship, with teaching, guidance, and evaluation tips provided for the mentor or teacher. The Creative Writer, Level One can be used as a complement to our non-fiction writing book, Writing With Skill, or it can be used on its own. This book is suitable for grades 6-9. Could The Creative Writer Level 1 be completed in a semester or would that be rushing the concepts too much? Are there any additional materials needed for Level 1? It could be done in a semester. That wouldn’t be too fast. And no, you don’t need any other materials. can the creative writer be used with the grammar curriculum and easy writer book 2,3 ? Yes…The Creative Writer would be a good once-a-week “fun” elective for a student who was already using those books. 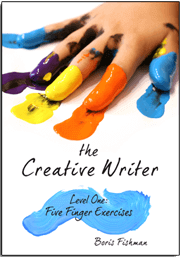 If my student has gone through the Writing with Skill, levels 1-3 already, where would she jump into the Creative Writer series?